Cold but sunny for several days. Lonestar Industries in West Oakland is (or is it was?) 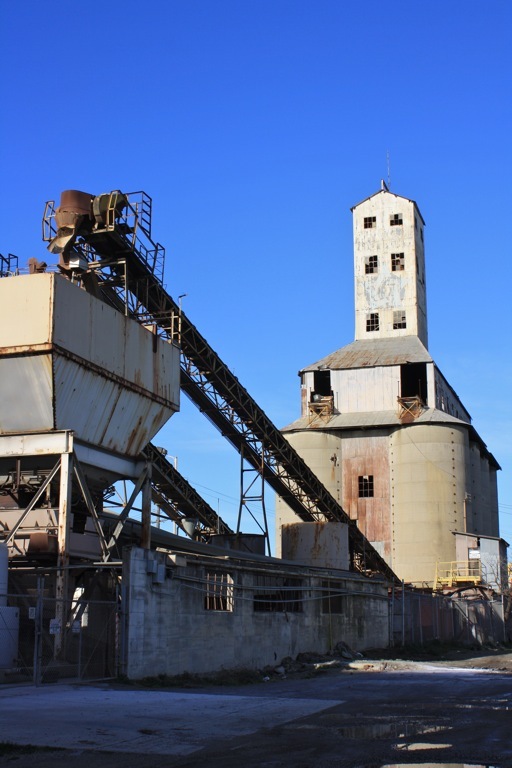 a cement factory next to Walker's Concrete, which was posted last week. Just off Mandela Parkway, this imposing structure seems to be an icon of our industrial past. Not something I'd want in my immediate neighborhood, but the lost jobs it represents is sad to see. For other skywatch photos from around the globe, visit Skywatch Friday. Nice clear and cold skies. It is sad to see the remnants of old jobs. I would take the jobs and not worry about the looks of this factory. Among the reasons America is in trouble is that the industrial base has either shut down or moved overseas. It reminds me of something you'd see being used as a movie set! Love those blue skies. It's been quite foggy over here on the other side of the hills. This is a really (ahem) concrete image you've posted here, Carolyn. The word verification is "retrial". an interesting subject and commentary. lovely blue sky. Great shot - Is the factory closed? Cement factories are no joy to work in... you'd have to bring in those migrants your country is so fond of (not!)... :-D Nice shot of a perfect blue sky. Clear blue sky somehow enhances the emptiness of this cement factory. Stunning Skywatch photo! It makes a neat photo, especially since the sky is such a clear blue. Lost jobs is never a good thing, I'm afraid. This just doesn't feel like California. It's more like a Midwest post-industrial city (an example is near at hand) but it says a lot about where wealth is made and how it is distributed throughout out country. Perhaps not beautiful, but imposing, and certainly important to have these pictures. Cool shot! I love finding things like this. It reminds me of a picture I posted a month or two ago except mine was black and white.